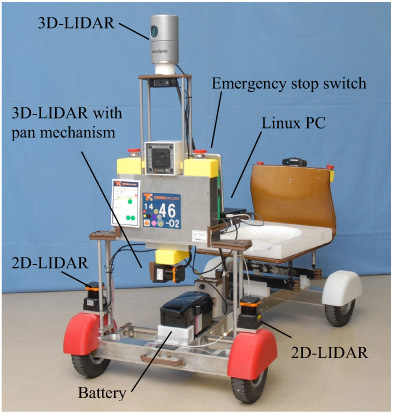 This paper is discusses an autonomous mobile robot entered in the Real World Robotics Challenges 2014 (RWRC) in Tsukuba. Our project was to develop a wheelchair able to navigate stairs autonomously. Step 1 develops a center articulated vehicle, called the AR Chair, which has 4 wheels and a controller including LIDARs. The center articulated vehicle has a stiff structure and travels with the front and rear wheels on the same path, so there is no inner wheels difference. The robotic vehicle carries users weighing up to 100 kg. The autonomous controller is the same as the Smart Dump 7 combined with the RWRC 2013 to achieve the challenge, excluding the geometrical relationship of the steering angle and communication command for motor drivers to the AR Chair. The advantage of the robot is shown by experimental data from the RWRC 2014’s final run. S. Ohkawa, Y. Takita, H. Date, and K. Kobayashi, “Development of Autonomous Mobile Robot Using Articulated Steering Vehicle and Lateral Guiding Method,” J. Robot. Mechatron., Vol.27, No.4, pp. 337-345, 2015. K. Yamauchi, N. Akai, R. Unai, K. Inoue, and K. Ozaki, “Person Detection Method Based on Color Layout in Real World Robot Challenge 2014,” J. of the Robotics and Mechatronics, Vol.26, No.2, pp. 151-157, 2014. N. Akai, K. Inoue, and K. Ozaki, “Autonomous Navigation Based on Magnetic and Geometric Landmarks on Environmental Structure in Real World,” J. of the Robotics and Mechatronics, Vol.26, No.2, pp. 158-165, 2014. J. Eeguchi and K. Ozaki, “Development of the Autonomous Mobile Robot for Target-Searching in Urban Areas in the Tsukuba Challenge 2013,&rdquo; J. of the Robotics and Mechatronics, Vol.26, No.2, pp. 166-176, 2014. S. A. Rahok, H. Oneda, A. Tanaka, and K. Ozaki, “A Robust Navigation Method for Mobile Robots in Real-World Environment,” J. of the Robotics and Mechatronics, Vol.26, No.2, pp. 177-184, 2014. M. Saito, K. Kiuchi, S. Shogo, T. Yokota, Y. Fujino, T. Saito, and Y. Kuroda, “Pre-Driving Needless System for Autonomous Mobile Robots Navigation in Real World Robot Challenge 2013,” J. of the Robotics and Mechatronics, Vol.26, No.2, pp. 185-195, 2014. K. Okawa, “Three Tiered Self-Localization of Two Position Estimation Using Three Dimensional Environment Map and Gyro-Odometry,” J. of the Robotics and Mechatronics, Vol.26, No.2, pp. 196-203, 2014. S Muramatsu, T. Tomizawa, S. Kudoh, and T. Suehiro, “Development of Intelligent Mobile Cart in a Crowded Environment – Robust Localization Technique with Unknown Objects –,” J. of the Robotics and Mechatronics, Vol.26, No.2, pp. 204-213, 2014. T. Suzuki, M. Kitamura, Y. Amano, and N. Kubo, “Autonomous Navigation of a Mobile Robot Based on GNSS/DR Integration in Outdoor Environments,” J. of the Robotics and Mechatronics, Vol.26, No.2, pp. 214-224, 2014. T. Shioya, K. Kogure, and N. Ohta, “Minimal Autonomous Mover – MG-11 for Tsukuba Challenge –,” J. of the Robotics and Mechatronics, Vol.26, No.2, pp. 225-235, 2014. M. Yokozuka and O. Matsumoto, “A Reasonable Path Planning via Path Energy Minimization,” J. of the Robotics and Mechatronics, Vol.26, No.2, pp. 236-224, 2014. H. Date and Y. Takita, “Real World Experiments of Autonomous Mobile Robot Smart Dump: Influence and Countermeasure of Human Crowd Behavior in a Pedestrian Environment,” J. of the Robotics Society of Japan, Vol.30, No.3, pp. 305-313, 2012. J. Kikuchi, H. Date, S. Ohkawa, V. Labat, and Y. Taktia, “Hierarchical approach using camera and LIDAR for searching people by autonomous mobile robot,” System Integration 2013, 1A2-2, 2013. Y. Takita, N. Shimoi, and H. Date, “Development of a Wheeled Mobile Robot “Octal Wheel” Realized Climbing up and Down Stairs,” Proc. of IROS2004 (CDROM), 2004. Y. Takita, “High-speed Driving of a Lateral Guided Vehicle with Sensor Steering Mechanism,” Trans. of The Japan Society of Mechanical Engineers, Series C, Vol.65, No.630, pp. 622-629, 1999. Y. Takita, “Drift Turning of Lateral Guided Vehicle with Sensor Steering Mechanism (application of a Variable Kinetic Friction Model),” Trans. of The Japan Society of Mechanical Engineers, Series C, Vol.68, No.675, pp. 3170-3177, 2002. Y. Takita, K. Kasai, and H. Date, “Proposition of SSM for Lateral Guided Vehicle with Articulated Body,” Trans. of The Japan Society of Mechanical Engineers, Series C, Vol.76, No.765, pp. 1130-1138, 2010. H. Date, S. Ohkawa, Y. Takita, and J. Kikuchi, “High Precision Localization of Mobile Robot Using LIDAR Intensity of Surface,” Trans. of the Japan Society of Mechanical Engineers, Series C, Vol.79, No.806, pp. 3389-3398, 2013. Y. Takita and H. Date, “Actualized autonomous functions by Smart Dump 3,” J. of the Society of Instrument and Control Engineers, Vol.49, No.9, pp. 636-639, 2010 (in Japanese). K. Kobayashi, H. Date, S. Ohkawa, and Y. Takita, “Detection and tracking of moving objects in the promenade,” 20th Robotics Symposia, 6B4, pp. 546-551, 2015 (in Japanese).